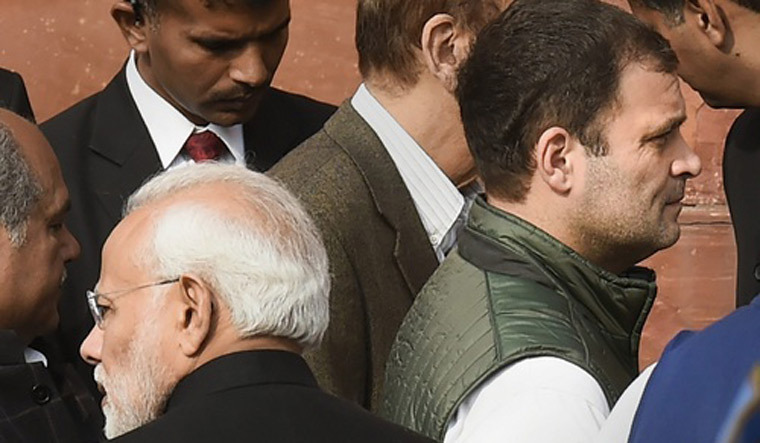 The Congress Wednesday sought registration of an FIR against Prime Minister Narendra Modi for "corruption" in the Rafale fighter jet deal, with party president Rahul Gandhi claiming that there "is now enough evidence" to prosecute him. Leading the party's charge, Gandhi alleged "the trail of corruption" in the Rafale fighter jet deal "begins and ends with" Modi. He also alleged "destruction of evidence" and "obvious cover-up" after the government told the Supreme Court on Wednesday that crucial files pertaining to the fighter jet deal with French firm Dassault Aviation were "stolen" from the Defence Ministry. "There is now enough evidence to prosecute the PM in the Rafale Scam. The trail of corruption begins & ends with him. That crucial Rafale files incriminating him are now reported 'stolen' by the Govt, is destruction of evidence & an obvious coverup," he said on Twitter, using the hashtag "FIRagainstCorruptModi". Should IAF worry about Pakistani pilots 'flying' Qatar's Rafale jets? The Congress chief's attack came on a day the government said in the Supreme Court that documents related to the Rafale fighter jet deal have been stolen from the Defence Ministry and threatened The Hindu newspaper with action under the the Official Secrets Act for publishing articles based on them. "The corruption and malfeasance in Rafale deal is out in the open. PM Modi misused his office to give benefits to Dassault Aviation and caused loss to the public exchequer," Congress chief spokesperson Randeep Surjewala told reporters. "It is now crystal clear that blatant and massive corruption has taken place in the Rafale deal. It is undoubtedly established that Modi misused his office as Prime Minister to grant undue benefit to Dassault Aviation and caused a loss to public exchequer. "This is a clear cut case under Section 13 (1) (d) of the Prevention of Corruption Act, 1988 and different provisions of Indian Penal Code. Time has now come to register an FIR against PM Modi and every other individual so that a time-bound investigation takes place in this entire sage of Rafale corruption reaching the highest echelons of power," he said. Citing a report of the Indian Negotiation Team (INT), now in the public domain, Surjewala said it was now crystal clear that Modi "misled Parliament and duped the country to cover up the murky dealings and blatant corruption, besides, squandering away national security interests". "This conspiracy has now been uncovered," he said, alleging that Modi did away with the 'bank guarantee' condition to cause a loss to the public exchequer and neither was the cost of India-specific enhancements included and nor was the cost of transfer of technology added. The Congress has claimed that the cost of 36 Rafale aircraft finalised by the Modi dispensation was higher than that negotiated by the previous UPA government. He said while calculating the price of 36 Rafale aircraft, the cost of India- specific enhancement, which is 1,300 Million Euros or Rs 9,750 crore, was not included. "Almost Rs 10,000 crore have to be paid and look at the angle of corruption further. When we were buying with the same specifications 126 Rafale aircraft during Congress Party regime, the cost of India-specific enhancements with same specification was 11.11 Million Euros or around Rs 82-83 crore. It has suddenly gone up...same India-specific enhancements...when Modi Ji buys 36 aircraft, it goes up 350 per cent to Rs 271 crore per aircraft. "So, from Rs 83 crore per aircraft, it goes to Rs 271 crore per aircraft. Why, it is the same India-specific enhancements, everything is the same and why are you not including its cost that has to be paid by India into the total value of the price of the aircraft," he alleged. He also alleged that bypassing the INT, Modi held "direct negotiations" to buy 36 Rafale aircraft and the proceedings of INT now establish that the final negotiations were held in France by National Security Advisor (NSA) Ajit Doval on January 12 and 13, 2016 and the final agreement was consequently signed on January 13, 2016. "This conclusively nails Modi Govt's white lie. Responsibility for negotiating the 36 Rafale aircraft purchase was that of the Indian Negotiating Team (INT) constituted by the Ministry of Defence on May 12, 2015. But PM Modi was indulging in direct negotiation with the French, which weakened the credibility of the INT," he alleged. He said Doval was not part of the Indian Negotiation Team (INT) and was not even authorised by the Cabinet Committee on Security for the same. "Simple question is, how is it the domain of NSA to negotiate and finalise a fighter aircraft purchase deal? Obviously, the PMO and the NSA were doing so under direct instructions of PM Narendra Modi," he said. The government has rejected the Congress's charge of corruption in the deal, with the ruling BJP accusing the party of spreading lies to target it ahead of parliamentary elections, scheduled for April-May.